A virtual reality software developer can't help investigating when he stumbles upon the body of a murdered woman and uses his programming talents to help him solve the murder. This story is very different from either the King David stories or the Music of Us series I've previously read, and yet, here as well, Poznansky manages to capture that lyrical storytelling magic that keeps you glued to the story long past your bedtime. Virtually Lace offers a pallet of lovingly portrayed characters including Michael, the developer hero, Lace, the murdered dancer and Ash the beautiful love interest, developer and model. 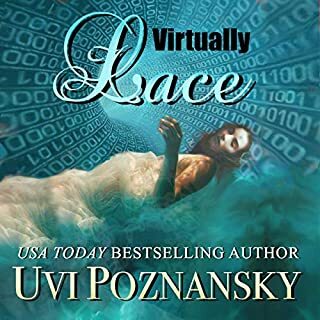 With convincing detail and her usual impeccable story-telling skills, Poznansky follows Michael's painstaking efforts to determine what happened to Lace, his building of his virtual model and his relationship with the beautiful Ash, herself an assault victim. The story, like Michael's model, starts slowly, with only a few details and then picks up speed and adds details until the reader finds himself hurtling toward an explosive conclusion you will not see coming. Although Virtually Lace will be a new kind of story for Poznansky fans, it's a thrill ride you will not soon forget.